Dogs and people have lived side-by-side for thousands of years. So it should come as no surprise that dogs and their people have much in common. Unfortunately, the shared experiences of our two species include a considerable risk of developing cancer at some point in our lives. In fact, dogs and people often suffer from cancers that are remarkably similar at the biological level. Take osteosarcoma, for example, a devastating form of bone cancer. In humans, osteosarcoma most often strikes teens and sometimes kids even younger. In dogs, osteosarcoma is most common in large and giant breeds, such as Great Danes, Rottweilers and Saint Bernards. There hasn’t been any notable progress in the treatment and survival of human or dog patients with osteosarcoma in the last 30 years. The statistics are grim: Only 70 percent of people with osteosarcoma survive for five years after their diagnosis. Most dogs don’t make it for more than a year. 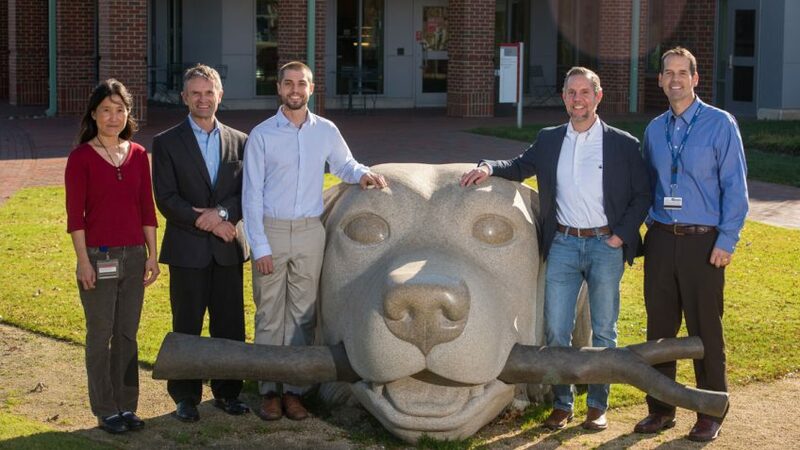 With support from a Duke/NC State Translational Research Grant from the Duke Clinical & Translational Science Institute, Eward and colleague Jonathan Fogle, a veterinary immunologist at NC State, are working to improve those odds for people and their pets by capitalizing on aspects of the disease that are unique to canines. Eward and Fogle are focusing their attention on a phenomenon that’s as peculiar as it is promising: after surgical procedures to remove osteosarcoma, dogs and people are more likely to survive the cancer for longer if their surgical wounds subsequently become infected. As Fogle explains it, osteosarcoma cells most likely manage to persist and spread in part by suppressing the immune system. As a result, immune cells fail to recognize the cancerous tumor cells as a threat and they don’t fight against them. If, however, an infection causes inflammation that spurs the immune system into action, it seems to compromise that arrangement between the immune cells and the cancer. Eward and Fogle are focusing their attention on a phenomenon that’s as peculiar as it is promising: after surgical procedures to remove osteosarcoma, dogs and people are more likely to survive the cancer for longer if their surgical wounds subsequently become infected. Eward, Fogle and their colleagues already have some evidence in support of this idea based on preliminary studies they’ve conducted in mouse models and cells in the lab. They’ve now proposed a series of experiments designed to further explore the role of small snippets of RNA called microRNA in shifting the immune system, and specifically immune cells called macrophages, between these more and less tolerant states. To explore this possibility in the new work, the researchers will culture healthy dog macrophages with osteosarcoma cells to find out whether it leads macrophages to shift gears in the expected way. They’ll be making comparisons between the microRNA profiles within macrophages isolated from human and dog osteosarcoma samples. They’ll also examine how exposure to bacteria changes both the microRNA profiles and macrophage behavior and whether it’s possible to override those effects using molecules that mimic or block particular microRNA molecules. If all goes well, the researchers say the next logical step is to seek funding for clinical trials of a treatment targeting the immune system via microRNA, to be conducted first in canine patients. “If it works in dogs or if the concept seems promising, then the next logical step is to apply the same techniques in human patients,” Fogle said. Despite the strong similarities between many human and animal diseases, most veterinarians and human doctors haven’t been in the habit of working together. Veterinary medicine and human medicine are typically practiced in isolation, with little connection between the two. But the collaboration comes rather naturally to this Duke-NC State team. In fact, before Eward went to medical school, he was trained as a veterinarian. His plan was never to leave veterinary medicine, but to do both. As it happens, Eward and Fogle crossed paths briefly many years ago at Auburn University’s College of Veterinary Medicine, where Eward earned his veterinary degree and Fogle spent a brief period as an intern. While they share an interest in comparative medicine, as an internist and a surgeon, their paths wouldn’t necessarily have crossed again if it hadn’t been for Joanne Tuohy, a veterinary surgeon now pursuing a post-doctoral PhD in Fogle’s lab at NC State. Tuohy knew from experience that dogs with osteosarcoma often die even after the tumor is removed, as the cancer spreads to distant sites. Her goal is to improve survival in her canine patients by enlisting help from the immune system. When Eward heard about what Tuohy was working on, he says his curiosity was piqued. The team has been working together for about four years, cobbling funding together through a series of small grants from the American Kennel Club and other sources. The new funding will enable them to take the next critical steps. The hope is that they can find ways to coax a patient’s immune system into fighting the cancer without the need for an uncontrolled infection. Eward says he’s also curious to learn whether dogs and kids who go on to develop osteosarcoma might have differences in their immune responses that make cancer more likely in the first place. “That would be really big news if we could figure that out,” he says. The Duke Clinical and Translational Science Institute is supported in part by the Duke CTSA grant [UL1TR001117]. The CTSA initiative is led by the National Center for Advancing Translational Sciences (NCATS) at the National Institutes of Health.